Presentation: History of neglect (foot injury originally from strangulation with chain); 3rd and 4th toes had previously been amputated but surgery site never healed and painful granulation tissue was now present. Dog was significantly lame on right hind leg. 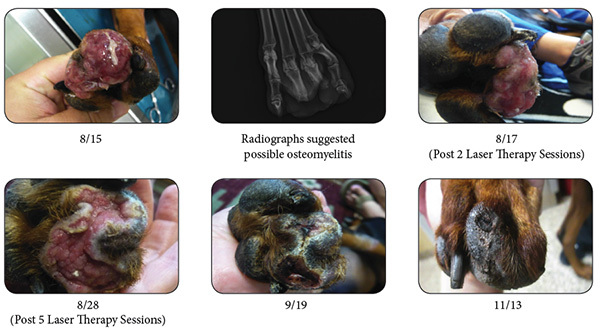 Radiographs suggested osteomyelitis. Surgeon recommended amputation but owners wished to try laser therapy as a last resort to save limb. Treatment Details: Bacterial C&S was submitted and pending results, patient was started on Clavamox and laser therapy was instituted 196 total joules delivered to affected area at 2W; EOD for 5 treatments, then every 5 days for 6 additional treatments. Ultimately, C&S grew multiple severe antibiotic resistant bacteria including Methicillin Resistant Staph, Pseudomonas aeruginosa, and Morganella morganii. All were resistant to Clavamox. Patient was started on appropriate antibiotic therapy 7 days later, after clinical improvement already noted.